In an old secluded home, a young girl named Amelia finds herself at the mercy of her oppressive and abusive Aunt Helen. Slowly Amelia starts to lose her grasp on reality and falls into a vortex of madness and the supernatural, soon believing she’s being stalked by an evil presence. 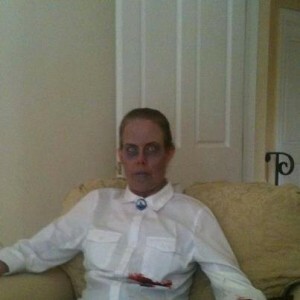 Is there something sinister haunting her from beyond the grave? Something Sinister went well beyond my expectations and frightened me many more times than I anticipated. The film is reminiscent of a lost 70s horror film. The baby cries, door knobs turning, voices from beyond the grave, figures in the background combined with the tense music will have you on edge. It gets your mind racing and wondering, similar to the films The Changeling and Burnt Offerings. Christopher Dye wrote and directed a film that did an excellent job at raising your curiosity and heart rate. Another quality of the film is that many things transpiring and going through Amelia’s head were explained to us visually, so there was no overkill of dialogue telling us what’s going on. When the film opens we meet Amelia (Rachel Appelbaum) and Rachel does an astounding job. She plays such a sweet girl, that’s scared, a bit crazy, and even suicidal, but through all those behaviors she’s still lovable. Then you have her not so lovable Aunt Helen (Maria Olsen) and right off the bat we know that Helen is one mean controlling woman! Maria’s character is a combination of Cinderella’s stepmother and the mother in Carrie. What impressed me with her character is she’s so threatening with her cold looks and expressions in lieu of screaming at Amelia. Besides being scary Aunt Helen doesn’t look good when she locks Amelia in the closet or ties her up to a tree, and she when she…well that’s enough spoilers the rest you can watch for yourself. Eric (Jeremy Gladen) is in love with Amelia, but there’s something about him that keeps you wondering if he’s involved with some of the insanity going on, similar with Amelia’s father (Johnny Francis Wolf). Everyone in the small cast of four did a terrific job in their roles to make the film compelling. 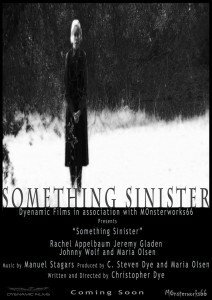 Check it out Something Sinister when it’s released. From start to finish you’ll be engrossed with Amelia’s eerie life and enjoy a frightening time with her.